NETWORK FINALS: There were no changes from the preliminaries in final numbers for Friday. CABLE HIGHLIGHTS: ESPN’s COLLEGE FOOTBALL bowl games were firmly in control of a truncated schedule of Friday cable with 3 games in the day’s Top 5: Ohio vs. Troy at 0.60, Navy vs. Louisiana Tech at 0.59, and Eastern Michigan vs. Old Dominion at 0.37. The only non-sports to break in was a 10AM HEY DUGGEE on Nickelodeon at 0.37. 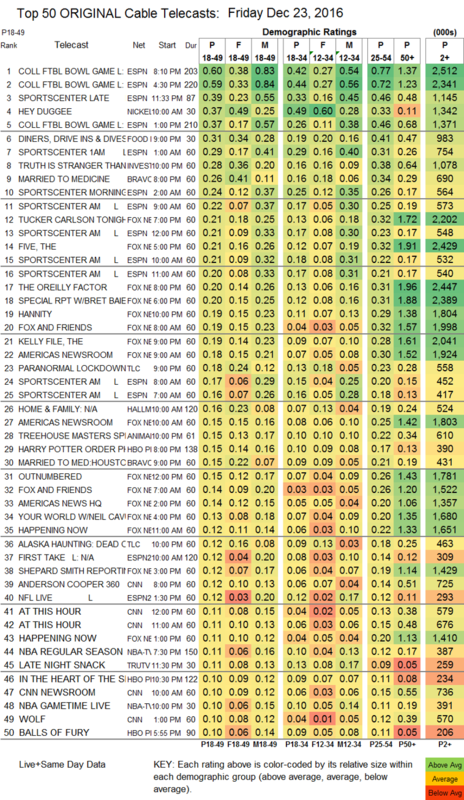 Food Network’s DINERS, DRIVE-INS & DIVES gained 0.03 to 0.31. ID’s TRUTH IS STRANGER rose 0.04 to 0.28. 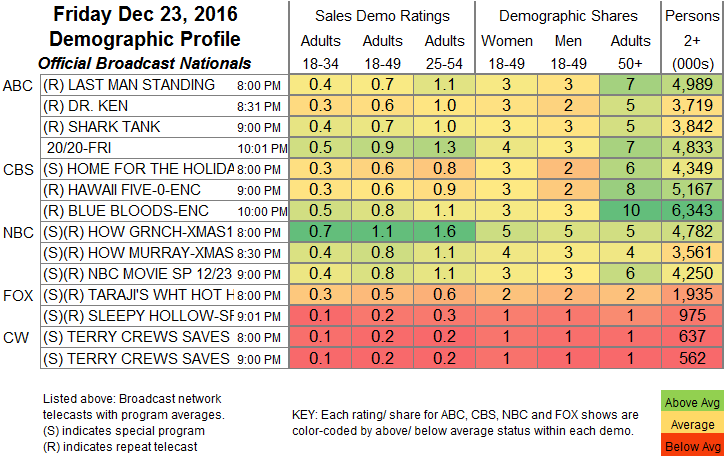 On Bravo, MARRIED TO MEDICINE ticked down to 0.26, and MARRIED TO MEDICINE HOUSTON was down 0.03 to 0.15. On TLC, PARANORMAL LOCKDOWN was steady at 0.18, and ALASKA HAUNTING was at 0.12.